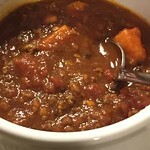 Sweet Potato Chili | Blog, Jane! Blog! I did make a few tweaks, based on what I know I like. But not much, And it was good! I cooked it in the crockpot. Add the ground beef and other ingredients, to your crockpot and let it simmer on low all day (8-10 hours) or on high for 4-5 hours.